developer.WordPress.org is a new portal for WordPress developers. It will provide educational tools to teach people about WordPress development (in the form of handbooks) and a reference for the WordPress codebase (the code reference). If the site succeeds at encouraging best practices in WordPress development, a potential side-effect is an improvement in users’ experience of third party plugins and themes. The primary team identified as a stakeholder is the docs team. However, three other teams are associated stakeholders and their input will be used in the development of the resources. They are: core, themes, and plugins. The net result of a successful implementation means improved documentation and educational information for new, intermediate, and experienced developers, ultimately affecting the entire project. @siobhan has volunteered to own this project. @samuelsidler will project manage and work with the above stakeholders (e.g., communicate with the team reps from each team). full testing of handbooks by amateur developers; they should be able to work through the handbooks and achieve the individual handbook’s goal by the end. developer.WordPress.org can be broken up into three components, each with their own specific tasks. Two handbooks are currently in progress and are pivotal to the success of this project. Both are being spearheaded by @hanni. 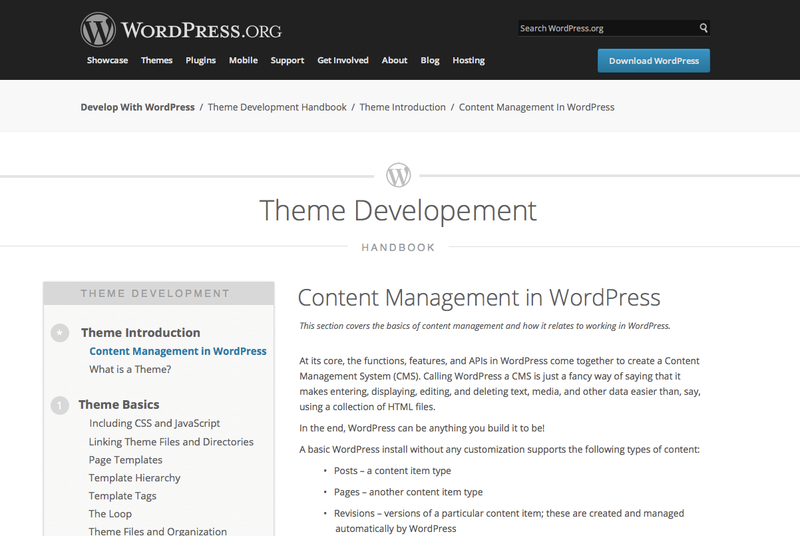 developer.WordPress.org should launch with the theme and plugin developer handbooks complete. More contributors are needed in this area to assist with writing, developing, editing, and testing the handbooks. Development of the code reference is currently in progress. @nacin to get alpha version online. 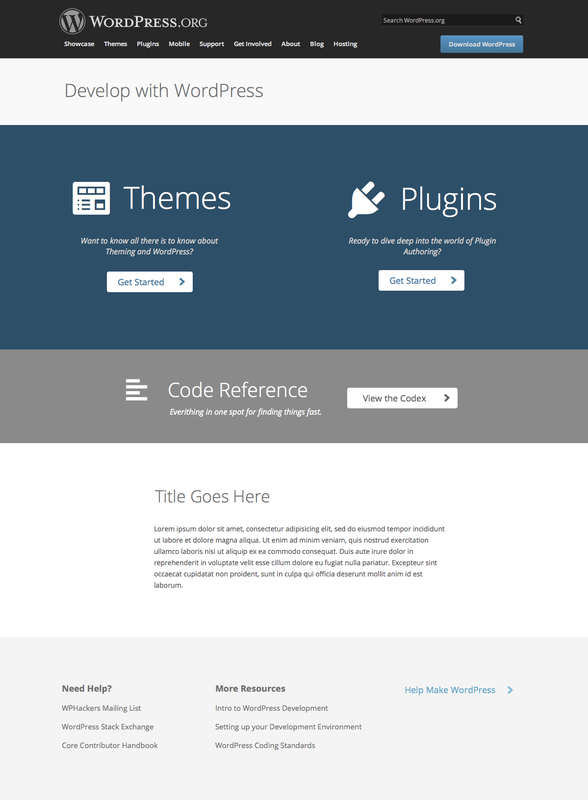 The code reference mockups look great! I like the breadcrumbs that show the relevant directory and file. I already asked a similar question here, but what’s going to be left of the codex if functions, hooks and classes are moved to developer.wordpress.org? Why not move everything and redirect the whole codex? I’d like to help out with the possible migration of that. The aim will be to move all of the developer docs from the Codex to dev.wp.org. Functions, hooks, and classes will be moving to the new code reference, narrative information will be moved to the handbooks and any other resources we decide to put there. Moving the content will take a long time as it’s not just a simple migration. Everything will need to be reviewed before moving to its new home and then the original Codex pages will be redirected. Once that process is complete we’ll start a review of the user documentation and start building a support hub for users. Thanks! I’d like to help with this once it’s online! Is it possible for the code reference feature to allow the inclusion of well written plugins? A section for none core code basically and only the most popular plugins which adhere to WordPress best practices are added. That’s not within the scope of the project right now. dev.wp.org will be documentation and educational resources for WordPress core. If we start adding third party plugins it could become sprawling. However, if there is demand for it we could investigate it once the initial project is complete. You could start experimenting with generating that documentation by running the parser  over your plugin code yourself. Really like the Code Ref mockups too, and this may not be the best place to discuss, but I’m wondering if it wouldn’t be better to include the “Used By” and “Uses” sections underneath the “Arguments” sections? I feel like most plugin and theme devs are looking for quick reference and would use the args a lot more than the Used By and Uses sections, which are also useful, but not as often for the average dev. Can the Accessibility team be added as associated stakeholders? One of the team’s primary objectives is to develop educational & outreach initiatives with regards to best practices in accessible web development. Accessibility is absolutely important, but most of your involvement will be specifically with the handbooks. I’d recommend working with the editors or @hanni to make sure your concerns get addressed. In fact, it’d be incredibly useful to have someone from the a11y team go through each handbook and note things that should be changed/fixed. So, what of people currently contributing to the Codex? I’ve contributed before and would like to be a part of this project. The code reference will be generated automatically using core. Anyone who wants to contribute to that part should work on improving the parser (linked above). For the handbooks, get in touch with the editor or @hanni if there isn’t already an editor. Obviously we’d love for volunteers to step up and work on the handbooks that haven’t been started yet. Are there other areas/ideas you’d be interested in that aren’t listed above? After upgrading from WordPress 3.5.2 to 3.6.1, with define(‘WP_DEBUG’, true); a site of mine’s showing warning for some deprecated codes throughout the site. Some of ’em are generated from my codes, and some of ’em are from plugins I’m using. In some of the messages, the debug process shows me what function to use instead, but in some cases, it’s not. So, it becomes difficult for me to find a new code that replaces the deprecated one. Some of them are well cited, with the new codes that replaces the deprecated one, but some of ’em are not, i.e. 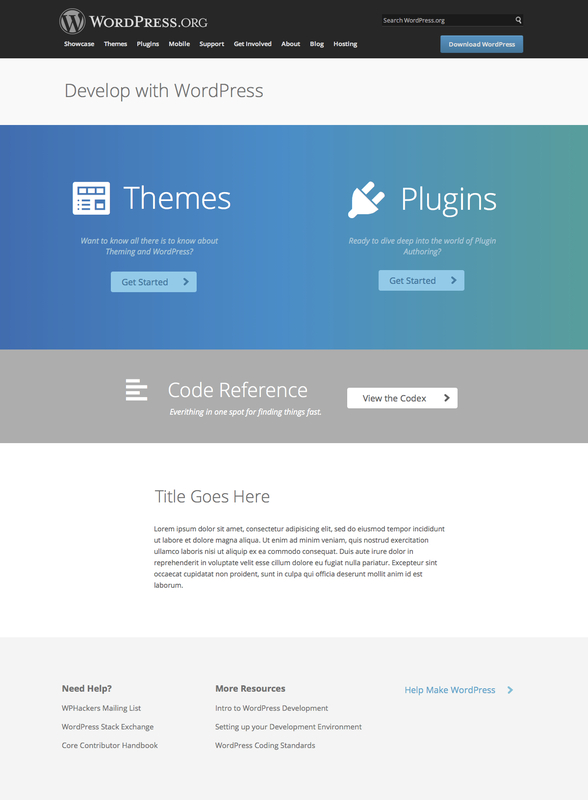 : this one (https://codex.wordpress.org/Function_Reference/unregister_sidebar_widget) (as on this revision: https://codex.wordpress.org/index.php?title=Function_Reference/unregister_sidebar_widget&oldid=97420). With this scenario, we know that some of the functions are replaced with another functions, while some other functions are replaced by a parameter of another different function. So, it’s a bit unpredictable which one can be used instead on this one. In this scenario, I think we need to find a place where we can sort all the deprecated functions with their new solutions, in a list. If such a thing is not available just now, we can make a separate page in Codex. We have plans for a deprecated functions list, as well as properly using @since to indicate when a function started to be used. It should be possible to add their new “solutions” to that list or at least on each function’s page.